Count me as a supporter of Japan’s decision to cast aside pacifism and to become the military counterweight to China that the United States needs and wants it to be, as well as becoming a country that can provide for its own defense needs without excessive reliance on the United States. To be sure, I don’t want Japan to use this moment to sweep war crimes under the rugs (as it is wont to do much too often, alas), but I do happen to believe that Japan can both become a serious and responsible military power, and at the same time, be cognizant of the lessons of history. At times, Japanese politicians seem determined to make me seem naïve and overly optimistic regarding that last expectation, but for every Japanese public figure who is willing to sweep the lessons of history under the rug, there are a host of other Japanese politicians who are determined to remember, and a Japanese public determined to help in the remembering. More power to that latter group. I wish that Japan were as good as Germany at reckoning with its past. Perhaps in time, it will be. But while it is important for Japan to come to terms with its history, it is equally important for the United States to have a powerful and well-armed ally with which to counter Chinese efforts to achieve regional hegemony. 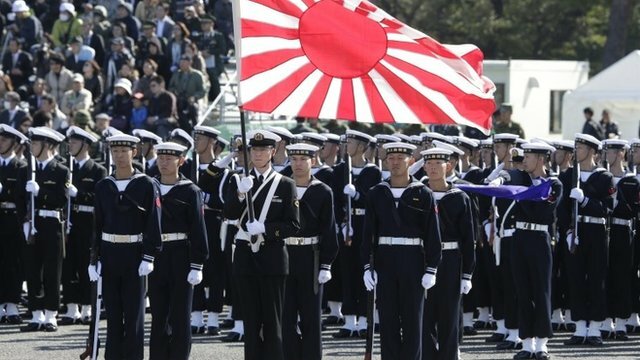 Japan’s decision to allow its armed forces to engage in military combat has served to put Beijing on notice, and has increased America’s ability to exert and impose its will in Asia. For anyone who wants to advance American security interests, the Japanese decision to transform the mission of its military is a welcome one.